You are here: Home > Family Forum – Who is responsible for clearing branches off my vacant block? Family Forum – Who is responsible for clearing branches off my vacant block? A neighbour’s tree had branches overhanging the fence into my property. The neighbours cut the branches and have left them on my vacant block. Who is responsible for clearing the branches off my vacant block? Your neighbour is not entitled to leave cut branches on your property, assuming you gave or will give permission to your neighbour to enter your property to remove them. However, bear in mind that your neighbour has saved you trouble and possibly expense (depending on the size of the branches) by cutting the overhanging branches. When branches fall by natural means, the tree owner may be liable in negligence. So they appear to be trying to do the right thing. The panel suggests that you talk to your neighbour about the branches. Tell the neighbour that you are grateful that the branches were cut. Ask the neighbour to remove them. You could offer to help. If the neighbour refuses to remove the branches, you could put them on the footpath outside the neighbour’s house (assuming they do not create a hazard), or drop them over the boundary, taking care not to damage plants or other things on the property. Above all, try to sort this out in a friendly way, as you will remain neighbours, and the trees may cause further problems. 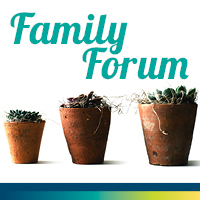 Family Forum is a panel of general practitioners, medical specialists, lawyers, therapeutic and financial counsellors to discuss each letter before the appropriate professional answers it. The panel is appointed by Relationships Australia SA. Have you got a question you’d like us to tackle? Fill out the form below or send questions to Family Forum, The Advertiser, 31 Waymouth St, Adelaide 5000. We treat communications in strict confidence except when the law demands otherwise, as in child abuse.